. 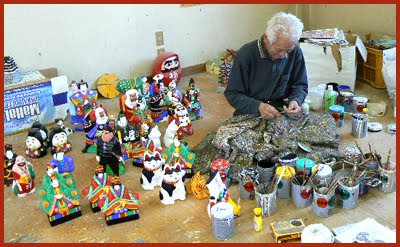 Shizuoka Folk Art - 静岡県　. 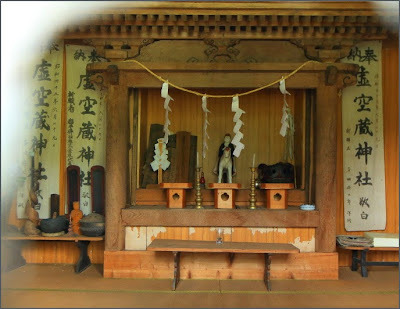 Kokūzō is especially important to Japan’s Shingon sect of Esoteric Buddhism (Mikkyō 密教). Kokūzō symbolizes the "vast and boundless" Buddha wisdom that permeates the universe. Believers pray to Kokūzō to grant them wisdom on their quest toward enlightenment. In Japan, people also pray to Kokūzō to improve their memory, technical skills, and artistic talents.
. Kokuuzoo Doo 虚空蔵堂 temple hall . The date of its foundation is not clear. At the beginning of the steps leading up to the shrine is a stone memorial for mount Gassan 月山の石塔, near the torii gate are more monuments reminding of The Three Mountains of Dewa 出羽三山. Maybe there was an influence of Tendai or Shingon Buddhism. There is a saying in the Tendai scriptures, where the celestial elements of Sun, Moon and Stars are mentioned as the beginning and end of our life and wisdom. At the back of this shrine is mount Dogusoku Yama 胴具足山 (615 m). 星ノ宮神社 Hoshi no Miya Jinja . 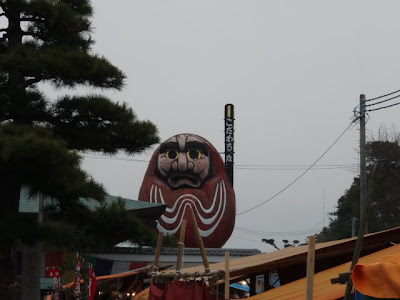 temples and shrines in Tono, Iwate . Terms referring generically to male and female ancestral kami (sojin). 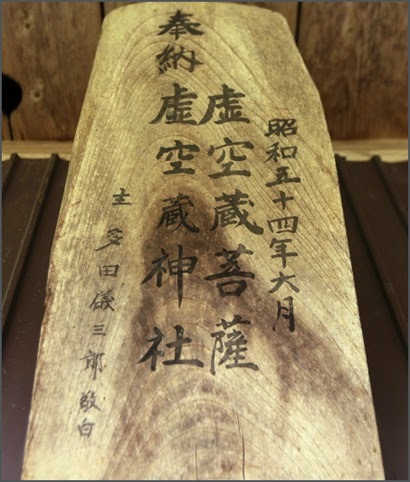 Examples can be found in the Shoku Nihongi, Engishiki, norito, Nakatominoyogoto, Hitachinokuni fudoki, Izumonokuni fudoki, Shoku Nihonkōki, and Kogoshūi. Commentators are agreed that the truncated kam means kami, while gi and mi refer, respectively, to male and female, but opinion is divided regarding the significance of the element ro. Kamo no Mabuchi interpreted kamuro to mean divine king, with the result that he understood the terms as referring to emperor and empress. Motoori Norinaga added the concept of ancestral deity to Mabuchi's interpretation, claiming that the two referred to divine ancestral deities of the emperor and empress. In the most general sense, the deities can be understood as ancestral kami. When the two deities are mentioned individually, they refer respectively to male and female kami, and when mentioned jointly as a pair, they refer to ancestral kami as a whole. Various suggestions have been made regarding to which specific kami these names might have originally referred. The Kogoshūi claims that the two refer to the kami of begetting, Takamimusuhi and Kamimusuhi, but Kamo no Mabuchi argues that the reference is broader, extending to all imperial ancestral kami. In contrast, Motoori understands the terms to refer to Takamimusuhi and Amaterasu. At present, the terms are believed to refer not to any specific kami, but to different beings in accordance with the context of the historical materials in which the terms are found. 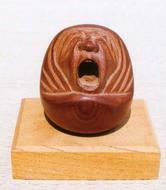 Akabeko is a famous cow amulet in the Aizu region of Japan. Aka means "red" and beko is Aizu dialect for "cow." 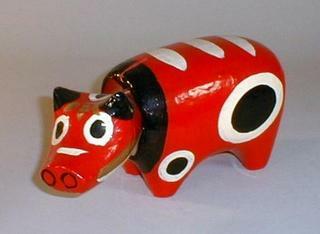 The akabeko papier-mache cow is a popular souvenir from Fukushima Prefecture. According to local folklore, in the year 807 A.D., cows were used to haul materials to construct Enzoji 圓蔵寺(えんぞうじ Enzooji) temple in Yanaizu 柳津. The priest Tokuichi Daishi had started the building in 807. Since it is located high above the river, many cows had to be used to haul the boulders up to the site. When the temple was completed, one particular red cow refused to leave the site. Legend has it that the cow even turned to stone after having given its soul to the Buddha. 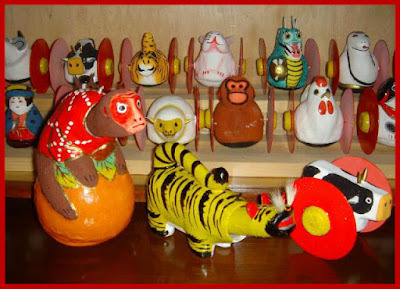 The townspeople, duly impressed with the cow's loyalty and no doubt its ability to turn itself to stone, made small effigies of the cow, painted them red, and gave them to children as toys. 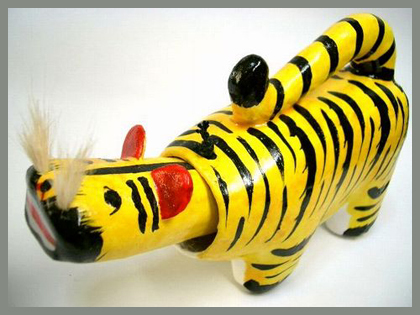 Years later, when a bout of smallpox swept the country, the children who had these akabeko toys didn't get smallpox. Enjoji holds one of the three famous statues of Kokuzo Bosatsu. Said to have been carved by Kobo Daishi himself. After he finished the statue, he trew some wood chips in the river Tadami as offerings. Whow and behold, they turned into the delicious dace fish, nurrishing the people. The Kokuzo statue is one of the three famous statues in Japan. Seine Weisheit und Tugend ist so grenzenlos wie der Weltraum. Verkörpert Einheit von Weisheit und Barmherzigkeit. Entstand aus der Anbetung des Himmels. Verkörpert die Theorie: Unendliches Glück und unendliche Weisheit sind in der Großen Leere das Gleiche. In Japan seit dem 8. Jhd. bekannt. Erste Figuren in der Tempyoo-Zeit; als Paar mit Kannon Bosatsu beim Bau des Großen Buddhas im Tempel Toodaiji in Nara. Als Paar mit Jizoo Bosatsu ebenfalls in dieser Zeit häufig gefertigt. Dabei war Jizoo für die Hölle und Kokuuzoo für das Paradies zuständig. KOKUU bedeutet "unübertroffen" und ZOO bedeutet "alle Schätze austeilen für die bedürftigen Menschen". Er verfügt über alle Schätze und sein Schatzhaus (zoo) ist das ganze All (kokuu). Im esoterischen Buddhismus auch als "Diamant-Schatzhaus" (Kongoozoo) oder "Diamant-Schatz" (Kongoohoo) bezeichnet. Außerdem Spender besonderer Gedächtniskräfte. Bei dem Ritual zur Verbesserung der Gedächtniskräfte des eso~terischen Buddhismus "Gumonji-hoo" ist Kokuuzoo selbst der Hauptkultgegenstand. Die an ihn glaubenden Priester stellten bald viele Statuen und Bilder von ihm her. Dieses Ritual wurde von Kooboo Daishi besonders gepflegt. (Im Japanischen heißt "auswendig" lernen: "aus dem Himmel lernen" (sora de oboeru). Nummer 13 der 13 Buddhas der Totenrituale. Seit der Edo-Zeit wurden Kinder beim 13. Geburtstag zu Tempeln des Kokuuzoo Bosatsu geführt (juusan mairi). Eigentlich sollte jedes Jahr einer der 13 Buddhas angebetet werden, dadurch verdienten die Tempel in der Edo-Zeit. Aber das wurde den Leuten in der Meiji-Zeit zu viel, so daß nur noch der zusammenfassende Tempelgang am 13. Geburtstag übrigblieb. Recht unterschiedliche Formen. Manchmal mit weiblichen Zügen. Hohe Krone mit fünf Weisheitsbuddhas. In der rechten Hand das Schwert der Lehre, in der linken eine Lotusblüte; manchmal auch eine Sutrarolle oder das wunscherfüllende Juwel. Sitzende Statuen im halben Lotussitz (Nara-Zeit) oder mit einem Bein über den Sockel hängend (ab Heian-Zeit). Zur weiten Verbreitung von Tugenden und Hilfen in alle Himmels~richtungen. Vertreibung von Feinden und sichere Geburt. Seit der Heian-Zeit besonders in der Shingon-Sekte verehrt. Fünf Bosatsu-Statuen auf fünf Tieren sitzend oder auf einem Lotussockel. 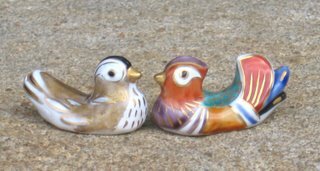 Tiere: in der Mitte: Löwe, im Osten: Elefant, im Süden: Pferd, im Westen: Pfau und im Norden: Garuda-Vogel. Donnerkeil mit einem oder drei Zacken an einer langen Stange in der linken Hand. Hohe Krone mit den fünf Weisheitsbuddhas. Nord: Schwarz - Gôyû (Gôyô) - Muku - Fukutoku Kokuuzoo. Hamamatsu (lit. Pine Tree on the Beach") is a town in western Shizuoka. 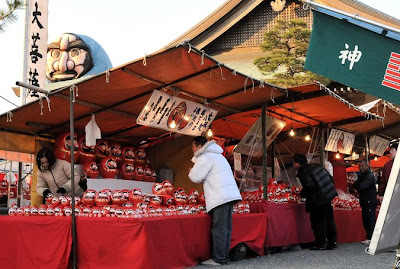 They were quite popular since the early Meiji period and many humorous figures were included, like the monkey on a persimmon. During WW II, most of the wooden forms were lost, but they were re-made soon to continue this special tradition of papermachee dolls. and a statue of Fudo Myo-O! The main statue is Kokuzo Bosatsu 虚空蔵菩薩. Kōbō Daishi performed the Gumonjihō (reciting the Mantra of Kokūzō one million times) at the age of 15 on the summit of Mt. Tairyū. With a statue of Kokuzo Bosatsu. Once there was a thunderbolt at 虚空蔵山 Mount Kokuzo-Yama. Bud Kokuzo Bosatsu caught the Raiju Yokai and told him "If you do that once again at this place, I will not let you go!" Since that time, there has not been a thunderbolt any more. The villagers were very pleased about it and now have a festival every year on January 13. In other parts they also know that if you venerate Kokuzo Bosatsu, there will be no thunderbolt.